Saint Henri has become one of my favourite neighbourhoods. 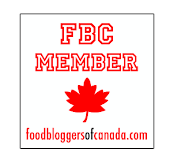 Not only is it very close to me, it is also home to most of the cities hottest and best restaurant. From higher priced Joe Beef and Tuck Shop, to sandwiches at Campanelli's, these gems come in all shapes and sizes. One such gem on the corner of du Couvent and Notre Dame blew my mind. I had heard about Ludger's food, but never been nor seen the place. Not knowing anything about the place, one could walk right by and never imagine that this happening bar serves up some delicious gourmet grub. Casual, almost dingy, would properly describe the decor at Ludger, but as the saying goes, “Never judge a book by its cover!” I am never one to judge restaurant by its looks, but I would have never believed the food coming out of their kitchen had I not been there myself. On a snowy February night, a few girlfriends and I set out to Ludger for a really late dinner. We sat at one of their banquet tables for four and waited patiently to order our drinks. Ludger has its menu on a chalk board hung high on the wall. I don’t mind this concept, however being half blind, not literally, it always takes me forever to piece together the menu. I really didn't even need to see the chalk board, our waitress knew her menu well and was able to not only tell me each item, she also suggested the perfect meal. My friends ordered a few dishes to share; polenta fries, a couple of orders of fried tofu and sautéed vegetables. After much debate, I decided on the bavette. The fried tofu was really beautifully presented and perfectly delicious. The tofu was crispy on the outside and perfectly soft and firm on the inside. 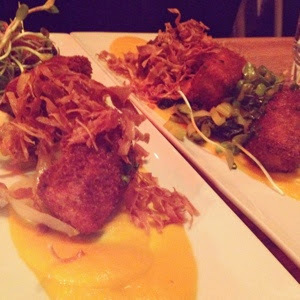 The spicy curry-Thai sauce complimented the fried tofu perfectly and added just the right touch of heat to the dish. Everyone at our table really enjoyed this dish, even though it was just tofu. The polenta fries come six to an order and are accompanied by a light dipping sauce. 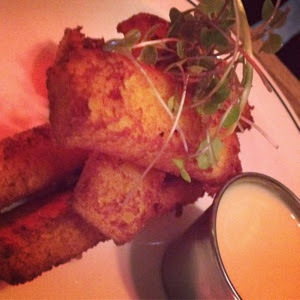 Golden and crispy on the outside, soft and creamy on the inside, Ludger’s polenta fries are a total must order. The creamy polenta was smooth and deliciously flavoured, these disappeared instantly at our table. 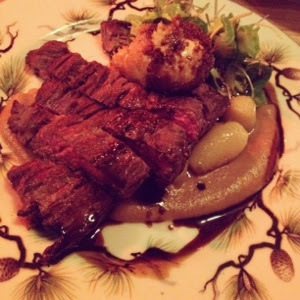 The bavette was served with a deliciously sweet yet savory onion confit, a bright Brussels sprout salad, pureed potatoes and a few delicious Jerusalem artichokes. The truly special element of this dish was the deep fried panko encrusted egg. Set atop the bavete, this delicious crispy on the outside gooey on the inside egg added yet another touch that enhanced this dish and elevated it to a whole new level. The bavette was cooked to a perfect medium rare and was quite enjoyable. Probably one of the best bavettes I have ever had. Tender and buttery are the only words that come to mind to describe this bavette. The onion confit paired perfectly with the tender flavourful meat. The side of Brussels sprouts was not what I was expecting. Shaved down into a cold vinegary salad, the Brussels sprouts were really refreshing and brightened up the dish. 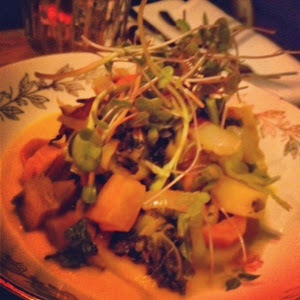 This really changed my outlook on how to serve Brussels sprouts as I enjoyed them much more than I ever thought I would. I loved every aspect of this plate and have been dreaming about it ever since. I think the success of this dish should not only be attributed to the flavours, but all the different textures as well. From sweet to vinegary and from tender to crunchy, this plate had all the right elements. We finished up our delicious plates and decided to order a couple of desserts to end our meal. We decided to order the Beignet a l’erable and the butterscotch verrine. 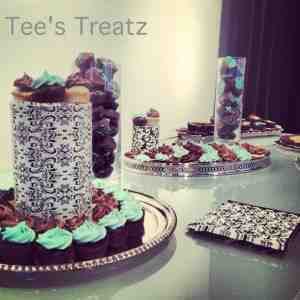 Both desserts were very appealing to the eye, however none of us actually enjoyed them. The beignet was very heavy and did not seem fresh. A little on the stale side and lacking flavour, we did not even realize it was a maple beignet. 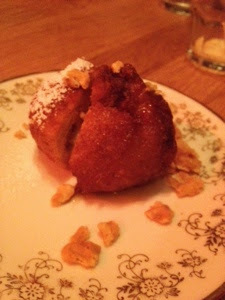 The butterscotch verrine was better than the beignet but still not as satisfying as we had hoped. 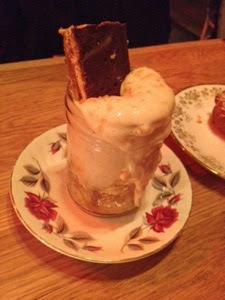 I enjoyed the balance of texture but sadly the flavour of the butterscotch verrine was missing something. 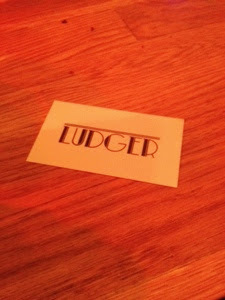 The food at Ludger was so good that the disappointing dessert didn't even faze us. We all left full of delicious food and completely satisfied with our Girl’s night out. As we walked to our cars, we all agreed the Ludger was a hit, another gem in St. Henri.